Become a birder and you’re suddenly a litterateur, too. It’s not much of a selling point, I suppose, but how else to explain the fact that birders, simply by association with the width and breadth of avifauna across the wide world, are also students of the english language. We learn by osmosis such SAT study words like harrier and harlequin and prothonotary, not to mention the veritable rainbow of colors from glaucous to roseate to hepatic to plumbeous. Take, for instance, the word “ruddy”. Outside of birding, when was the last time you used it? It may be the perfect word for describing the nose of a overweight drunk, but otherwise, it’s not a word you use often. And yet, we birders know it refers ot a particular shade of purplish red, as used to describe a duck, or a ground-dove, or a turnstone. 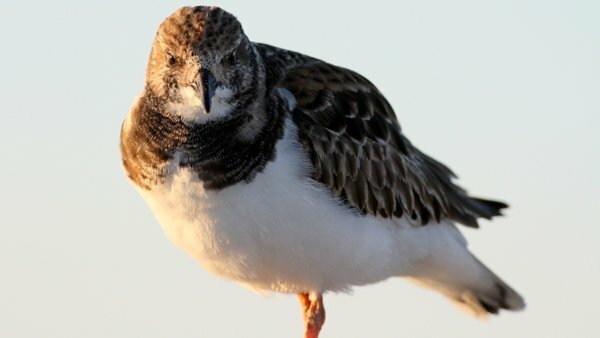 I realize this beat of mine is supposed to have a southeastern bent, and the Ruddy Turnstone is a fairly common seaside dweller on both sides of the North American continent. 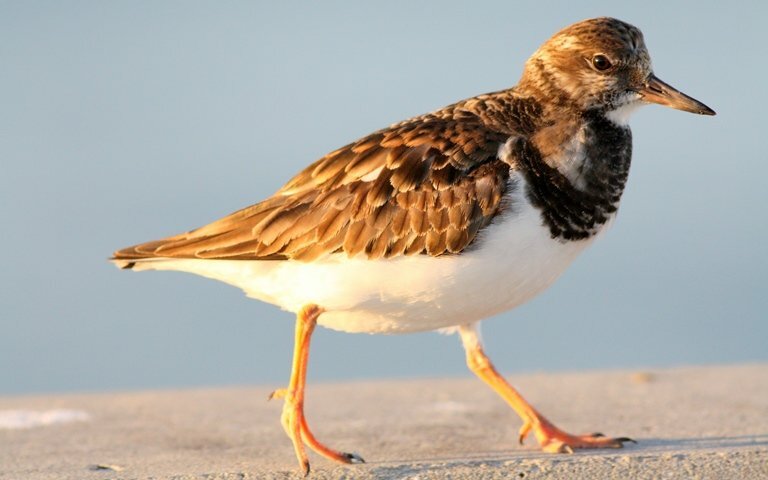 In fact, it’s one of the few species of birds that’s found on the six major, not ice-covered, continents. 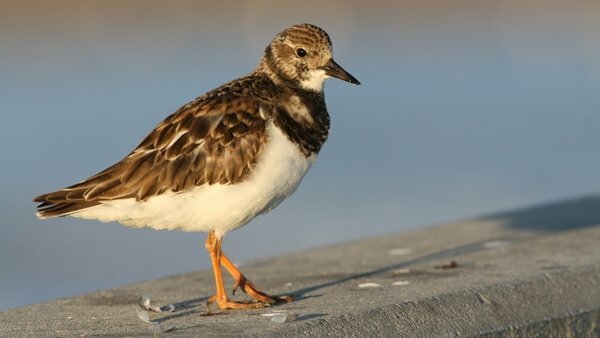 And now that I think about it, there are probably very few birds in the world that are as well-known as Ruddy Turnstones, and yet, with that patchwork pattern and those striking orange legs, who is able to prevent themselves from experiencing that little jolt of pleasant surprise when you come across one? Not long ago I was down on the southern coast of North Carolina, staked out with a group of birders seawatching on a long concrete pier on Wrightsville Beach. Every single one of the assembled had eyeballs to eyepiece aimed out at the horizon parsing the masses of congregated Common Loons for the one Pacific Loon that had been seen on and off at this spot for the last couple weeks. For far too long I had joined them, and I was experiencing the early onsets of “scope-eye”, that mildly uncomfortable ache you experience in your non-dominant eye when you’re squinting into a scope for hours on end. 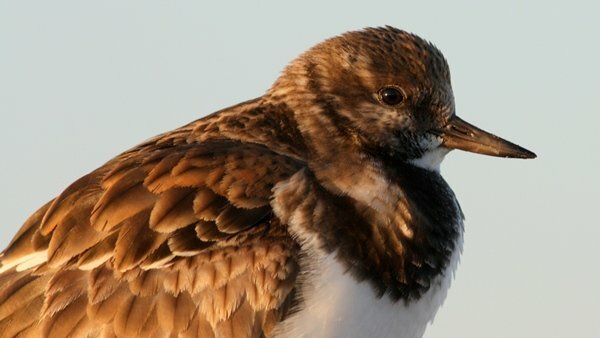 Assuming that I would hear if the Pac Loon showed up, I turned to the quartet of turnstones working the pier for bits of fish scraps. They were remarkably accustomed to the comings and goings of people and allowed really close approach, a nice change from scattering turnstones on seaside rocks. It’s odd to see these elegant birds scavenging like common starlings, but there they were, causing the parade of birders heading down the length of the structure to pause briefly and smile to themselves as they defied expectations and failed to flush time after time. Note that specialized bill, equally adept at rummaging through garbage bins as flipping surfside pebbles. It’s not turned up at all, but the perfectly straight culmen and the lower mandible rising to meet it gives the impression. Compared to everybody else in the shorebird clan, it looks like it was affixed upside-down. Concrete is hardly the most natural environment for photography, but you takes what you gets. The Pac Loon never made an appearance. The birders scattered and went on to other things, including my group which had Harlequin Ducks and Black-chinned Hummingbirds on the agenda. None offered better looks, however, and none offered a better opportunity for literary scholarship either. Beautiful shots, Nate! What a cutie. It’s been far too long since I’ve seen these guys. 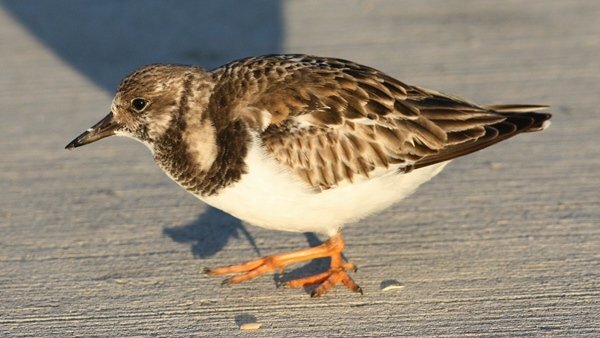 I’ve been appalled to find Ruddy Turnstones scavenging amongst the garbage pails in Florida. “Have some dignity,” I tell them, “You are shorebirds, not feral pigeons.” Like other people in my life, they don’t listen. Now, when will you blog about Ruddy Ducks? @Donna- Maybe, but I’d much rather write about ground-doves. Too bad it wasn’t Ruff & Ruddy for you!